I have been having some fun with my camisole-skirts. The pattern calls for a zip at the CB. However when trying on my green one during construction I found it was loose enough to be pulled on over the head. Then at my gym I witnessed a young woman put a dress-mascarading-as-a-skirt’n’blouse in this way – within a few minutes she appeared fully dressed. (I so wanted to take a photograph, but the circumstances prevented it). The skirt part was black, with an elasticated waist, and the cream blouse part was arranged as a wrap around, surplice top. Within moments she added a belt, and instantaneiously looked pulled together and smart. It was a young look and the fabrics and colours were unsophisticated. I don’t like an elasticated waist. But it got me thinking about how I might like to make a skirt and blouse “ensemble”. The idea of a great fit, top and bottom, and a waist seam in exactly the right place so it rides neither up or down, in nice coorindating fabrics, is an idea that appeals to me. I couldn’t find many images on the internet to show what I mean. But this dress from Hobbs is quite a nice version. I don’t want to copy this dress exactly, but I think for women (like me) who find it hard to buy an all in one dress – due to being different “high street sizes” top and bottom – a version of this dress might be a boon. Mixing two complementary fabrics, in terms of both fabric composition and colour palette, and possibly including a grosgrain belt in a third shade, gives the home dressmaker a good basis for creating a number of very workable dresses that look professional and pulled together for work. In addition one could add a jacket in the same fabric as the skirt and have what looks like a suit but feels like a dress. Some of the vintage Chanel suits appear to have a silk blouse stitched to the skirt. 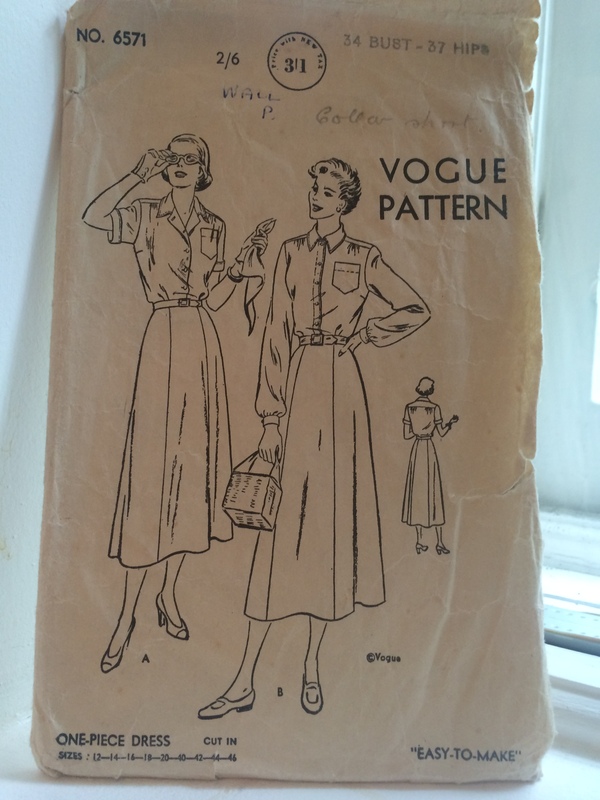 I bought a vintage pattern some time ago (stamped 15 April 1950 – although it has a 1940s look) as it was described as a “one piece dress”. As you can see from the drawing. Looking at the construction notes it was soon evident that the “Easy to Make” dress is actually quite hard work, involving bound buttonholes, home-made shoulder pads and belt, and a regulation placket or “slide fastener” (ie zip) at the side seam. The pattern assumes that the dress was made from the same fabric (unspecified) throughout, which could be a plaid, rather than contrasting fabrics. The side opening allows it to be put on, but it is not a very elegant fix. As soon as I have the SWAP out of the way (end of April) I am going to work on this pattern. Idea 1: a princess seam dress where the dress is in just three pieces with the main shaping in the CB seam and the two shoulder/underbust/front waist panels. The skirt would be slightly flared. Then it is sliced in two around the waist seam, but with the possibly of it being shaped. I have signed up for a draping class at Morley (you may remember I intended to do advanced pattern cutting last term, but I decided it was too advanced for me). This idea may be developed there. A blirt. Or maybe a sklouse. Great idea. Chanel often attached the blouse to the skirt; prevented the blouse from becoming untucked and messy. Intriguing… after you have perfected a pattern I will have to copy you. 🙂 I really like that Hobbs dress, but I could definitely see this in a wrap or faux-wrap style. Very exciting re. the draping class! !